The hustle and bustle of holiday travel is upon us. The surge of families with small children and less-experienced travelers at airports across the country means busier terminals, shorter tempers, and heightened levels of excitement…for some. As a result, the holiday-induced shift in travel patterns has me once again thinking about aviation, so get ready to journey with me as I explore the history of the Jet Age in this second installation in my series on aviation history. As I mentioned in the first installment in this series, titled, “Modern Day Research Trips and The Famed Golden Age of Travel,” World War II resulted in major changes for the aviation industry. 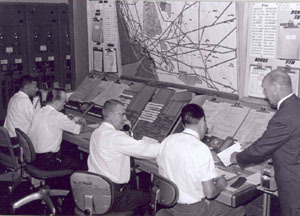 Technological improvements included the development of radar and air traffic control towers, both of which improved the safety and efficiency of air traffic. However, the most important technological improvement in the post-war era was the advent of commercial jets. These types of aircraft flew faster and higher than the previous piston-engine varieties. While the military recognized the value of these innovations and supported the continuing development of this technology, commercial aircraft manufacturers and civilian airline carriers were hesitant to introduce jet aircraft to the civilian aviation industry because of the added costs associated with manufacturing this new aircraft. In particular, metal alloy components were expensive and the new jets had higher operating costs, such as jet fuel and the construction costs associated with longer runways that were needed for take-offs and landings. 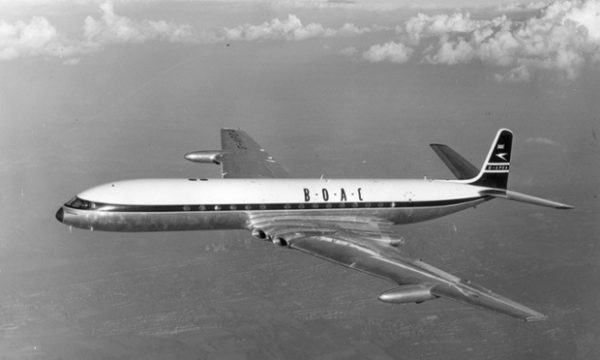 Nevertheless, British Overseas Aircraft Corporation began commercial jet service on May 2, 1952, when it introduced the “Comet,” the 36-passenger jet that flew 480 miles per hour, nearly three times the speed of the DC-3, the most popular civilian aircraft of the 1940s. Although the Comet’s life was shortened due to various high-profile crashes and accidents, American airline corporations began experimenting with their own lines of commercial jets. As such, the jet airplane initiated a major shift in American travel. By 1956 the scales had tipped, marking the year that more people traveled by air than by sleeper and coach trains across the United States. Within two more years, cross-Atlantic civilian air travel had also outstripped travel by ocean liners. It was clear that jet aircraft, with a comfortably pressurized, relatively quiet, and vibration-free cabin, were here to stay. 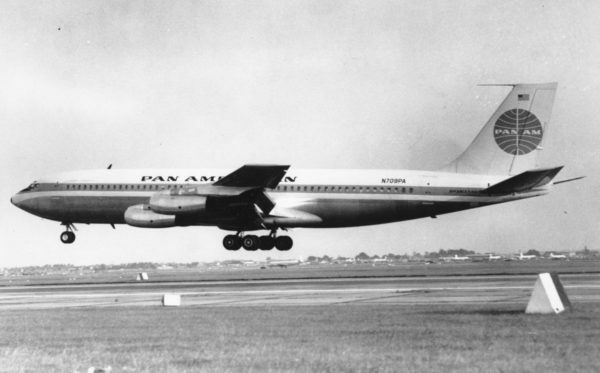 These early jets paved the way for Boeing to develop its first commercial jet, the Boeing 707, which Pan American World Airways debuted in October 1958 during its maiden flight from New York to Paris, with a single refueling stop in Newfoundland. The Boeing 707 became the prototype for all other jet aircraft, as its design doubled the speed of jet travel and greatly contributed to the efficiency and productivity of the civilian aviation industry. These improvements allowed passenger fares to begin to drop by the 1960s. Both U.S. and International carriers quickly adopted jet aircraft, making jet airline service the norm for civilian aviation across the world. Yet, despite these innovations and the attempt to lower costs for travelers, air travel during the 1960s and 1970s was not without concerns or discomforts. The “lower costs” were still relative. A round trip flight from London to New York cost around $550 in 1970, however, in today’s dollars that flight would set you back about $3,400. Since 1974, the cost of domestic air travel has actually dropped by roughly 50%, meaning that the experience and convenience of air travel has become more affordable for a much larger demographic today than during the “golden age” of air travel. Turbulence also existed in the 1960s and 1970s, as it does now; however, passenger safety was not nearly as high on carriers’ priority lists as it is today. This meant that an unexpected patch of rough air could cause serious injury to passengers on the early jet airliners, when aircraft were equipped with un-tempered glass, sharp edges, and loose furniture was the norm. I should also mention the health concerns of travel during this period, when nearly every passenger faced second-hand (or first-hand, if you happened to be a smoker) cigarette smoke. 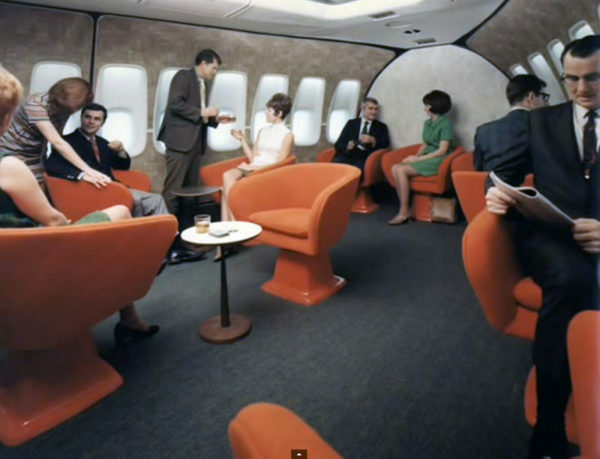 Boeing 747 “upper deck” lounges as pictured here. Pan Am, TWA, United, National, Continental, Iberia, JAL, and SAS all had Boeing 747s in their fleets. Photo credit. Since the 1970s, the airlines’ focus on customer service and customer experience has indeed shifted. Gone are the lounge sections in the aircraft cabins that were outfitted with actual tables and chairs; real silverware and crystal (in coach) and hot meals (in most cases); and roomier and more comfortable seats. This shift in passenger experience was closely related to the 1978 adoption of the Airline Deregulation Act, a law that changed the airline industry dramatically. This act dissolved the Civil Aeronautics Board, which had, since 1938 regulated the airline industry much like a public utility. Without the government regulations, airlines were suddenly competing on an open market, and company concerns quickly expanded beyond the scope of customer satisfaction. This act also meant that many of the larger carriers that prided themselves on customer experience, such as TWA or Pan American, were unprepared to compete. In place of these large companies, “low-cost carriers” emerged to fill market gaps. The biggest success story of these carriers is undoubtedly Southwest Airlines, who before the deregulation of 1978 only flew routes in Texas. In 2013, Southwest was the largest domestic U.S. carrier in terms of passenger traffic. Southwest Airlines is the unexpected underdog in the post-1978 aviation world. They also have a super cool historic timeline on their website. Photo credit. Today’s travel experiences with cramped quarters, delayed flights, incredibly long security lines, and carry-on baggage fees does make one reminisce about what it was like to fly “back then.” But in examining the history of the aviation history, there are two takeaways: first, everything is relative, and second, the only constant in history is change. From today’s window seat, flying during the “golden age” might look better, but I will take today’s modern aircraft over the realities of unlimited smoke and scotch of air travel’s yesteryear.